Explanation: It's easy to get lost following the intricate filaments in this detailed mosaic image of faint supernova remnant Simeis 147. Also cataloged as Sh2-240 and seen towards the constellation Taurus, it covers nearly 3 degrees (6 full moons) on the sky. That corresponds to a width of 150 light-years at the stellar debris cloud's estimated distance of 3,000 light-years. The remarkable composite includes image data taken through narrow-band filters to highlight emission from hydrogen and oxygen atoms tracing regions of shocked, glowing gas. 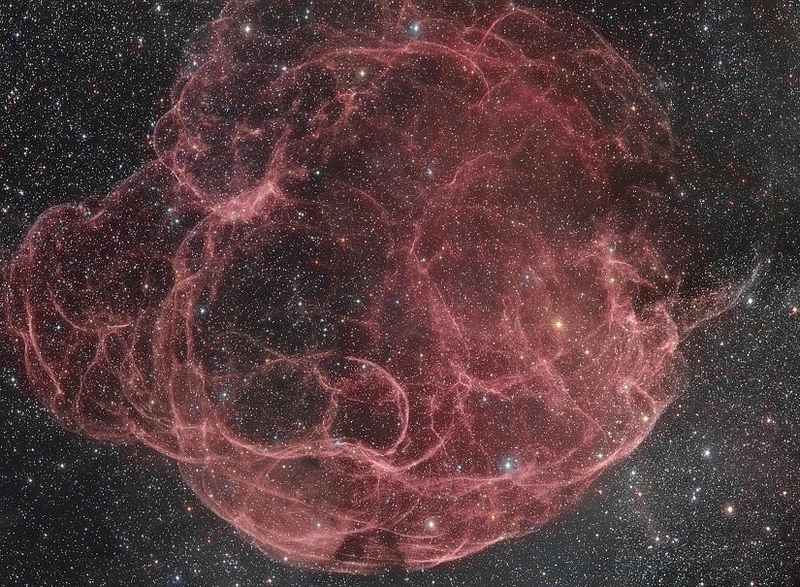 This supernova remnant has an estimated age of about 40,000 years - meaning light from the massive stellar explosion first reached Earth 40,000 years ago. But this expanding remnant is not the only aftermath. The cosmic catastrophe also left behind a spinning neutron star or pulsar, all that remains of the original star's core.